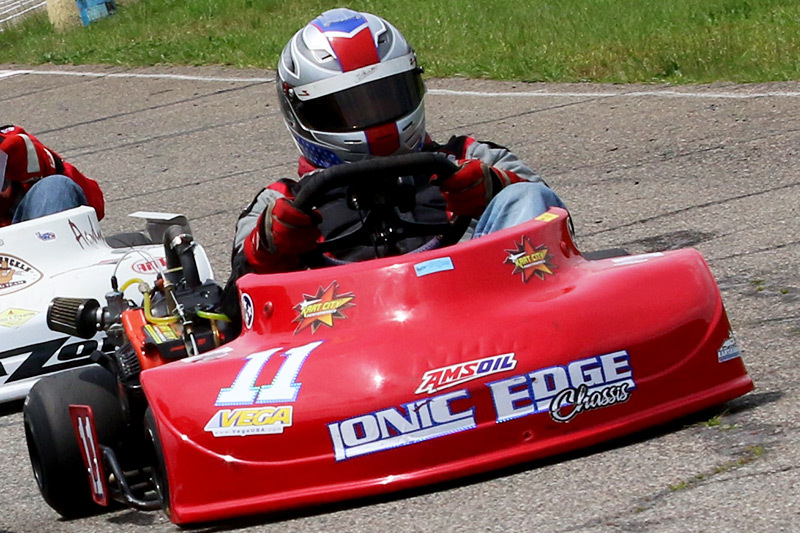 Five IONIC Edge Chassis drivers attended Round 2 of the AKRA / Vega USA American Sprint Cup Series “Southern Tour” April 29-May 1 at the famous Lamar County Speedway in Barnesville, GA, one of the country’s longest-running kart tracks. Tennessee’s Matt Skaggs and Louisiana’s Macon Moore rode their IONIC Edge’s to victory at event. 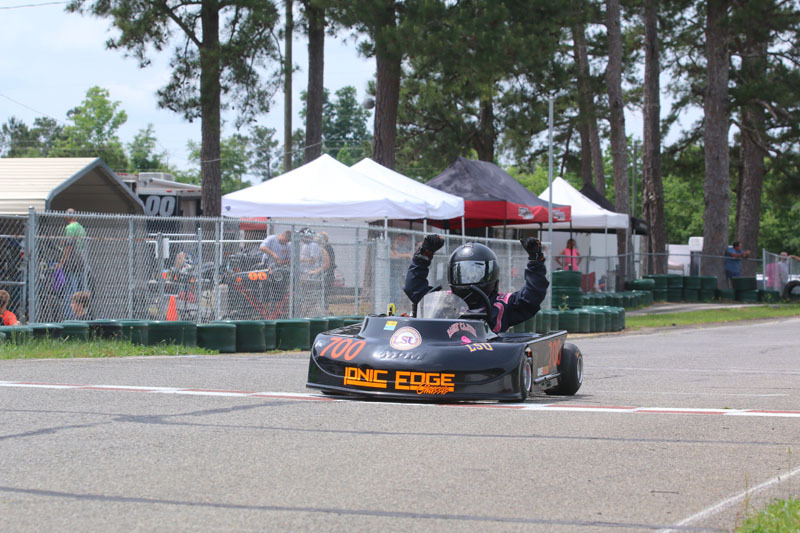 Both Skaggs and Moore won on Sunday with Moore picking up the 206 Junior main event and Skaggs triumphing in a competitive 206 Masters class. Moore settled for P2 in Saturday’s 206 Junior race before the team made several adjustments before Sunday’s program. The changes worked as Moore dominated the day, winning the $50 pole award and scoring the heat and main event victories for his first AKRA win of the season. Congrats, Macon! Skaggs was another driver who made adjustments after Saturday’s racing and came out swinging on Sunday. After finishing P3 in Saturday’s Masters final, Skaggs won Sunday’s pole award and $50 bonus and backed it up with a win in the 12-lap heat. Skaggs battled fellow veteran Joey Miller throughout the 18-lap feature with the two swapping the lead on a couple of occasions until around mid-race Skaggs settled into the top spot and held off Miller for the remainder of the final. The win marked Matt’s first of the year after coming close to victory at Jacksonville Gold Cup and Round 1 of the AKRA Southern Tour at Kershaw in March. Matt’s nephew Elijah Skaggs was one of the top racers in the 206 Cadet division at Barnesville. While Elijah barely missed victory, the Tennessee shoe finished P2 both days. 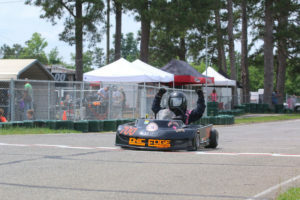 On Saturday, Elijah crossed the stripe several kart-lengths back from Tanner Carter but Sunday he was much closer, challenging Carter throughout the race before crossing the finish line just 0.2 seconds back. Elijah keeps coming close to winning at AKRA race and we know it won’t be long before he’s a Southern Tour race winner! Camryn Reed and Morgan Harbin also rode IONIC Edge’s at Barnesville. Camryn continues gain experience and improve in the 206 Cadet class. She finished P5 Saturday and P6 Sunday, and the highlight of her weekend was holding off two other driver’s challenges to finish a strong third in the Cadet 12-lap heat race. Harbin made his first trip to an AKRA race and spent Saturday learning the tight, tricky Barnesville course in the 206 Senior Medium division. Harbin finished fifth, and gained a ton of experience that will help him the next time he attends a touring series event. 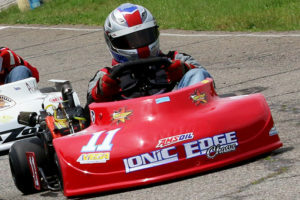 Next up for the IONIC Edge Chassis crew will be the opening rounds of the Briggs & Stratton 206 Cup Series May 21-22 at Road America in Elkhart Lake, WI, and June 11-12 at the Badger Kart Club in Dousman, WI. In the Southeast, the next big event is round 2 of the WKA Gold Cup Nationals at Carolina Motorsports Park.